One of the most remarkable weapons to show during the dinosaur arms race of the Cretaceous Period was the big bony tail club wielded by some members of a group of tank-like plant-eaters. A new study provides a step-by-step account of the progress of this distinctive feature possessed by the heavily armored dinosaur Ankylosaurus and its cousins, a bludgeon that may have given even the violent Tyrannosaurus rex reason to worry. The researchers studied fossils of the group called ankylosaurs with early, primitive species with no tail club and later ones with a fully developed one. Ankylosaurs began to evolve tail clubs much earlier than formerly thought, the researchers found, and the clubs evolved in two steps over tens of millions of years. First, vertebrae in the back part of the tail changed so that the tail became stiff. Next, bones that form in the skin to provide body armor, called osteoderms, became very large at the tip of the tail and entirely enveloped the tail's end to form a club that could be swung at an enemy. Ankylosaurs lived at a time when the main land predators in Earth's history including T. rex roamed the landscape, dismembering other dinosaurs with great jaws and serrated teeth. In an arms race, some plant-eaters developed suspicious weaponry. "A tail club was absolutely an effective weapon and could have broken the ankle of a predator," said paleontologist Victoria Arbour of North Carolina State University and the North Carolina Museum of Natural Sciences, who led the study published this week in the Journal of Anatomy. "But in living animals today, weapons are also often used for battling members of your own species - consider the horns of bighorn sheep or the antlers of deer - so perhaps ankylosaurs did something alike." Ankylosaurs were wide-bodied, four-legged dinosaurs enclosed in bony plates and spikes. 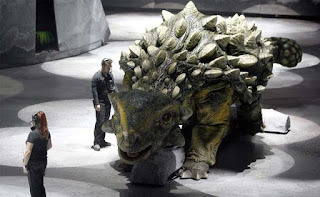 The oldest known ankylosaur dated from around 160 million years ago during the Jurassic Period, Arbour said. The first fully formed ankylosaur tail club appeared around 75 million years ago during the Cretaceous. Ankylosaurus, measuring around 20 feet (6 meters), was the largest and last of the ankylosaurs, living at the end of the age of dinosaurs about 65 million years ago.